Queer idols and queer representation in K-Pop are few and far between. Admittedly male K-Pop idols are allowed to be more feminine than men elsewhere. Yet, female idols who reject femininity are seen as peculiar. Affection between two male or two female K-Pop idols is encouraged, but only as fan-service meant to appease screaming fans. Being a queer K-Pop fan then, can often be a disheartening experience. Being an K-Pop fan of colour can be an ever more disheartening experience. K-Pop groups constantly appropriate culture in their music videos but end up pretending as if individuals of colour don’t exist. One would be hard-pressed to remember the last time a Black or Brown model was the protagonist in a K-Pop MV. Holland, in his debut single “Neverland,” and its accompanying music video, unlocked the door of positive representation in K-Pop. With “I’m Not Afraid,” Holland breaks the door down. Please, help me untie these knots. Holland’s voice is mixed better in “I’m Not Afraid,” compared to “Neverland,” though like “Neverland”, the song’s visuals outweigh its aurals. 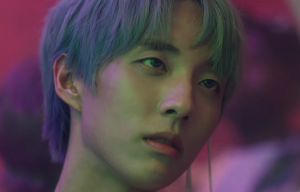 The MV begins with Holland opening his eyes in bed, an attempt at being unafraid upon recognising how he is unable to feeling everything with his eyes closed. Holland peeks through his bedroom window to find his friends coming over to his house, their arms laden with food and alcohol. What strikes the viewer immediately is how diverse Holland’s friend group is. It is hard to recall the last time a mainstream K-Pop MV featured Black or Brown people as anything other than backup dancers. Holland’s “I’m Not Afraid,” however, visibly features a Black boy, a Black girl, and a drag queen as a prominent members of Holland’s friend group. Holland and his friends alternate between gorging themselves with food, setting up for a party, and taking pictures. The natural light peppered with hints of green during this montage highlight the joy and intimacy present among friends. Holland and his friends’ obvious love for each other can’t help but make the viewer smile. The MV transitions to the very party Holland and his friends had been setting up for. Bathed in green and red, they take shots, with both cameras and alcohol. A man—Holland’s boyfriend judging by how Holland hugs and cuddles him— walks into the party and interrupts this montage for a few moments. Then, it’s back to fun and picture-taking. During the bridge, the song slows down and the MV heats up as Holland and several of his friends kiss their romantic partners. Holland’s “prolonged” kissing scene with his partners was apparently what earned “I’m Not Afraid” an R-Rating from YouTube, though YouTube resolved the issue after Holland tweeted about it. YouTube’s error enraged many fans, including yours truly. It seemed unfair and homophobic considering YouTube didn’t flag a certain YouTuber’s Vlog containing a corpse in the recent past, but has previously demonetized videos of LGBTQ+ creators simply for their content. Holland himself stated that he did not think his kissing scene was as stimulating as ones in straight music videos and deemed YouTube’s actions discriminatory. The video ends much like it began — with Holland opening his eyes, but on a grassy field rather than in his bedroom. The words “On the Second Moon” flash on the screen, teasing Holland’s forthcoming music. With its diverse cast featuring members of varying races, gender identities, and sexualities, “I’m Not Afraid” makes a bold and beautiful statement about inclusivity and representation. It is a cohesive and heartwarming MV that gives queer K-Pop fans and K-Pop fans of colour the representation many of them have desperately been seeking for. After watching this MV, I, too, don’t want to be afraid anymore.